Gracing the halls of Buckingham palace is not a honor which many modern day artists can claim on their CV. ML Snowden’s extensive body of reverent work has caught the eye of not only astute of art collectors the world over but royalty as well. Ms. Snowden’s prolific artwork, her inspiration and her legacy have been explored in many published works by insightful authors such as Dr. Daniel Winn, Dr. Marie Busco and James Edwards. The purity and intensity of her art inspires a vast audience of devotees, equally inspiring engineers and art patrons alike. 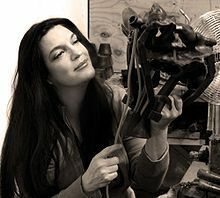 With faultless artistry, she captures the essence of spirituality in her sculptures yet manages to achieve groundbreaking metallurgical and engineering advancements as she tests the scientific borders of her materials. Her willingness to experiment with new methods and face potential failure reveals a strength of vision seldom present in potentially fragile artists; her fearless quest to stretch the medium of bronze casting has resulted in breathtaking sculpture, but achieved at great risk. She takes an “all or nothing at all” approach. The “lost wax casting” method bears with it the danger that if the casting process fails, the artwork is lost. On this foundation, Snowden has not clung to the safe route on a diminutive scale, but instead has chosen to unleash the skills with which God has blessed her, apply the legacy of knowledge passed on to her through her father and her mentors, wield the sculpting tools and techniques inherited from the studios of Auguste Rodin and engage in a lifelong quest to capture the beauty of divinity on a staggering scale. Not simply a glimpse of the ephemeral, Snowden’s work, at its heart, offers us the opportunity to gaze with awe at the dynamic spirit of God. Her devotion to revealing profound messages transcends physical and intellectual limitations. Whether her subject reveals mankind’s struggles on a herculean plane or the infinite attention to the detail of Hebrew’s smallest letter, Snowden’s adroit touch captures fluidity and grace in a permanent medium for all to enjoy and admire. Perhaps her post graduate studies in Europe, beginning after completing her B.F.A. at Loyola Marymount in 1974 and winning the Try Foundation Prize, which enabled her to work at The Louvre in France, the Vatican Collections in Rome, the Uffizi and the Academy of the Try Foundation in Italy provided her an insider’s access to the secrets of the old world masters, but undoubtedly the opportunity to apprentice with her own father for 17 years was pivotal to her development. Shepherding and guiding an artistic genius is not a responsibility to be undertaken lightly; her father, a renown artist in his own right, instilled in his daughter artistic joy coupled with discipline, an untiring work ethic, deep respect for history and an intimate appreciation of the responsibility to bring to life art which elevates the viewer. He provided a rich environment in which to percolate her potential and lived to see the world appreciate her gifts. No fledgling stage for Snowden, the world welcomed her with open arms as she won the First Class Medal in 1974 at the Des Beaux Arts Annual Exhibition in Paris followed quickly by the Gold Award in 1975 for her Sculpture from the Brindesi Institute Exposition in Verona and a showing of her sculpture and drawings in 1976 for the Bonaparte Society in Paris. Since then, her work has been collected and exhibited from San Francisco to Switzerland, from Toronto to Tokyo, from New York to Paris. Her early membership in the Jesuit Scholastic Honor Society perhaps foretold of her ambition to integrate her faith with her artistic and academic studies. Whether she is sculpting a bronze relief of Miriam, Sister of Moses, creating Great Golden Angels for the Main Altar in the Los Angeles Cathedral of Our Lady of the Angels, lecturing on the Fractal and Euclidian Geometries of Sculpture or being showcased in “M.L. Snowden –Glories of the Vatican”, her unflinching dedication achieves a unique blend of art, faith and science. The recipient of awards too extensive and numerous to name, Snowden has graciously consented to interviews, cooperated with the production of books and documentaries, participated in exhibitions and shows and undertaken majestic commissions of significant proportion while simultaneously exploring, nurturing and reinventing her craft in her studios located in Austria, Paris and California. Most recently, Snowden has collaborated with ABC for a television project showcasing the Glendale sculpture, completed two significant publications M.L. Snowden Sculpture Museum, and M.L. Snowden: Bronze Masterworks of the Geological Coreium, and overseen the installation of major works in Qatar, Washington DC and The Butler Institute of American Art. FineArt360 is deeply honored to represent the work of ML Snowden.